For water-wise solutions and fresh ideas, our selection of over 100 sculptural, low-water succulents meets the demands of retail and wholesale nurseries, garden centers and landscape professionals. 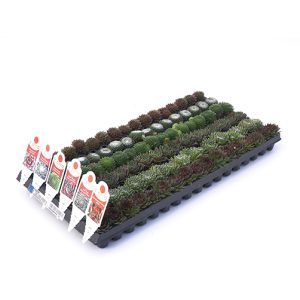 From jewel-like rosettes to ground-hugging cover to upright, stacked succulents in various hues, all forms inspire creativity for large projects like living roofs, vertical gardens, and mixed combos; to smaller, simple gifts like table accents, terrariums, and dish gardens. Landscape and interior designers, event planners, and home gardeners have discovered these beautiful and low maintenance succulents, but it takes high-quality growers like you to make their bold, creative ideas come to life. Optional picture tags are available for each variety. Tags on select varieties are required by breeder. Varieties are based on availability. 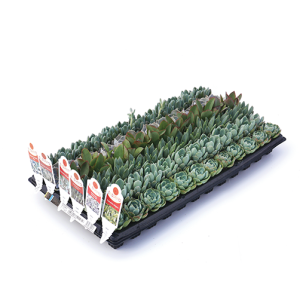 Great assortment of six larger succulent varieties on availability, such as Crassula, Aeonium, Senecio, and Kalanchoe, for 6” pots, 1-gallon pots, succulent combos, or landscape. 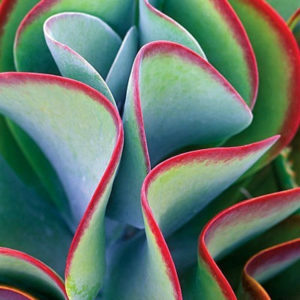 Great assortment of Echeveria varieties on availability are perfect for 6” pots, succulent combos, or landscape. Beautiful assortment of high-quality Sedum varieties on availability for 6” pots, succulent combos, or landscape. Non-listed items may be ordered. See Custom Propagation services. Please include an additional week for processing and submit orders no later than Wednesday by 4pm PST, 4 weeks prior to stick.